The 29th July until the 13th August marked the annual Wildlife Trusts National Marine Week during which we have been celebrating all things marine. We’ve been throwing an array of exciting events, conducting marine mammal surveys from the shore and on boat trips run by Dolphin Survey Boat Trips and hundreds of people have had the opportunity to enjoy our 360 Virtual Reality experiences. We have also been asking people to take to social media to post their seaside photographs and stories using the hashtag #TheSeaAndMe. As well as all this we’ve used National Marine Week as an opportunity to help us to develop a new and very exciting project. Our Living Seas Wales project will use awe-inspiring, pioneering and engaging experiences to build connections and inspire action for our seas. It will provide participants with opportunities to learn about, enjoy and contribute to the conservation of the marine environment and how they can impact on its future whether they live on the coast, use the marine environment for work or leisure, or live inland and visit the coast on holiday. 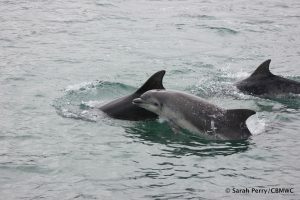 “One of the core aims of the Wildlife Trusts Living Seas team is to raise awareness of the wonderful wildlife of Cardigan Bay. Many people are not aware of just how special the waters off the coast of Wales are and that parts are designated as Special Areas of Conservation (SACs), designed to protect specific habitats and species. We have a wealth of marine life in Welsh waters that we would like people to join us in finding out about” says Sarah Perry, The Wildlife Trusts Living Seas Science Officer. To help us to develop the project, we are undertaking consultation with the communities within which we’ll work. Please spare just 5 minutes for Welsh marine wildlife to answer four simple questions about what you currently think about Wales’ coastal and marine wildlife? The online survey will close on the 6th of September but hardcopies will be available from Cardigan Bay Marine Wildlife Centre in New Quay, Ceredigion. We are keen to hear everyone’s views! To find out more about this new project, contact Sarah Perry on s.perry@welshwildlife.org.